Born and raised in Miami, Florida. I love animals, Science Fiction, and I’m a total bookworm. Totally captivated and enthralled with Star Trek, The Original Series 1966-69, I was attracted to Captain Kirk’s good looks and commanding presence, and had a big crush on Mr. Spock, with his phenomenal intellect. But I followed Dr. McCoy’s lead into medicine. I attended undergraduate school at U of South Florida, Tampa, Florida. And I attended veterinary School at U of Florida Gainesville, Florida and graduated in 1980. 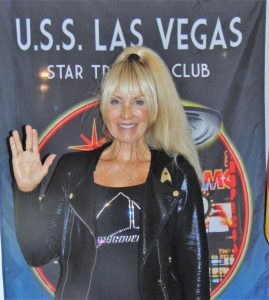 During all this time, I was too busy to watch any Star Trek re-runs on TV, but I did attend a Star Trek convention that was in Gainesville, Florida, in 1979 and I certainly watched all of the Star Trek movies that came out!! My first job as a veterinarian, was in Sparks, Nevada. While there, I saw Gene Roddenberry at a lecture at University of Reno. He is called the Great Bird of the Galaxy, and I realize he was a great visionary, and wonderful writer, but what I remember of his lecture, is that he was a really boring speaker! I am a fan of ALL of the Star Trek series, and now I am also a fan of the ‘alternate’ Star Trek universe created by JJ Abrams in the 2009 movie. I guess some of Star Trek’s appeal to me, besides the science fiction, was that women could be ANYTHING in Star Trek, even Starship Captains, and were treated just the same as the men. Even called ‘Sir’! Another interesting note, is that as a doctor on a starship visiting alien worlds, medicine was not limited to humans, but other non-human (although sentient) life-forms. I felt that as a veterinarian, working on non-human life forms, one must learn all of the physiological differences of the different species, the same as Dr. McCoy, Dr. Crusher, Dr. Bashir or the Emergency Medical Holographic Program, The Doctor, (I am not sure what Dr. Phlox’s medical background entails!) they had to learn all of the differences of a Vulcan, Klingon, Cardassian, Bajoran, etc. And am looking forward to my future as the Chief Medical Officer on the USS Las Vegas!